in Atlantic City, talks about the club. 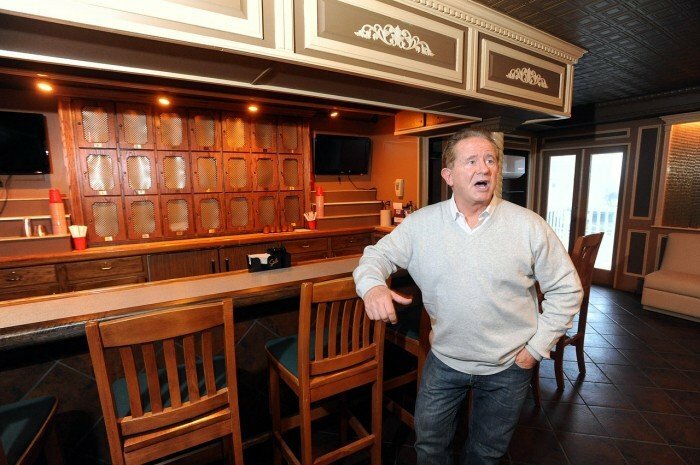 Tom Sherwood Sr., of Brigantine, owner and architect behind the Diving Horse entertainment complex, which includes Saints and Sinners, talks in the BYO bar area of the club. Role Play is entering its third year of operation this summer; Saints and Sinners opened last year as part of the complete renovation and redesign of the Diving Horse entertainment complex and hotel. Role Play and Saints and Sinners market themselves as upscale experiences, and shy away from the term “swingers” itself. Each club requires memberships, and entry fees range from $50 per person at Saints and Sinners to $100 for single men at Role Play. Saints and Sinners does not permit single men — only couples and single women — while Role Play allows a certain number on Fridays only. The memberships include confidentiality agreements, stipulating that members are not to take photos or videos in the clubs.